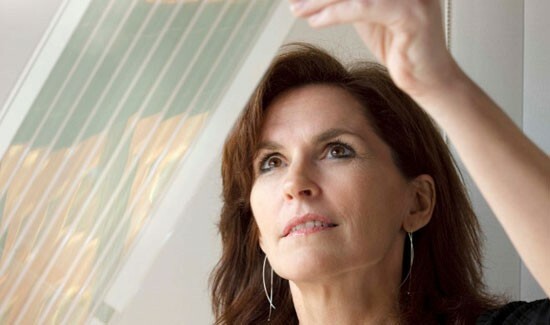 Recent gains in the efficiency, lifespan and manufacturing of thin-film plastic solar panels have advocates convinced that, this time, solar really is on the verge of a revolution – even as the market crashes around them. In what was once a Polaroid factory 50 miles south of Boston, a high-tech company is printing sheets of solar cells made of plastic, trying to create tomorrow’s energy source amid the tumult of today’s energy market. The solar collectors made by the Konarka company in New Bedford, Ma., are thin and transparent. They curl into lightweight rolls and can be unfurled and put on a wall or a tent or an impoverished hut to begin producing electricity – though feeble electricity at this point – from sunlight. Scientists in university and private labs worldwide have raced to make these plastic solar cells practical for 30 years. A recent succession of efficiency gains has researchers, investors and companies convinced the effort is finally close to success. “This will be ‘energy to go,'” said Steffanie Rohr, head of marketing for Heliatek, a German company that also has plans to begin commercial production of 1-foot by 4-foot plastic solar strips this year. But their advances are coming just as the commercial market for solar cell manufacturing is in a tailspin. Prospects for the market success of the plastic photovoltaics are dimmed by plunging prices of silicon solar modules, which have fallen from $4 per watt in 2008 to just over $1 a watt now. Researchers talk about promise and potential. But year after year the graphs always look the same – the potential is always three or four years out.